Colorado caters to just about any tourist with its diverse range of family-friendly attractions. From educational learning programs, to recreational fun, the family-friendly in Colorado are guaranteed to make a great day. Head to one of the museums on a rainy day or experience wild animals at the incredible zoos and sanctuaries in the state. These 15 family-friendly attractions in Colorado offer a variety of great entertainment options that are perfect for any type of family visiting or living in the Centennial State. The Denver Museum of Nature & Science makes for a great educational outing in the Mile High City. Check out the neat programs playing in the IMAX theater or view the exhibits focusing on space, rocks and gems, the human body or dinosaurs. The Denver Museum of Nature & Science is open daily and is sure to engage every member of the family. Head to Keenesburg, which is 30 miles east of Denver, to view 720 acres of wildlife sanctuary. View a variety of wildlife, such as lions, wolves, grizzly bears, leopards, cougars and other wildlife that has been rescued. Versus a zoo, these exotic and endangered animals are free to roam. Visit during sunset to see and hear the most action. Make Elitch Gardens Theme & Water Park a regular visit during the summer months. Located in Denver, Elitch is open from May to October. With 53 rides and attractions, such as roller coasters, a full water park and other entertainment options like shows and concerts, everyone in the family is sure to have fun here. The Children’s Museum in Denver has engaging indoor exhibits as well as an outdoor adventure park. The exhibits vary but focus on nature, science or art. The 60,000-square-foot outdoor park has water features and playgrounds that make for a great resting place for parents and a fun experience for kids. Located in Fort Collins, Fort Fun features popular attractions that are fun for both mom and dad and kids alike. Play a round of mini golf, race on the go-kart track or bump around in the bumper cars. Other attractions that are sure to make for a fun family outing are the video arcade, paddle boats, ice skate rink, laser tag, batting cages and giant slide. Visit the Denver Zoo to view exotic animals and learn about wildlife through educational programs. The Denver Zoo is home to 4,300 animals and over 600 different species. This zoo is known as the greenest zoo in America, which means it is dedicated to upholding environmental standards. Don’t miss out on the Monkey Island and the big cat exhibit, which are the most popular features at this family-friendly attraction. Head to the Downtown Aquarium in Denver to view a whole underwater world. There are over one million gallons of water at the Downtown Aquarium, which house a variety of aquatic life. 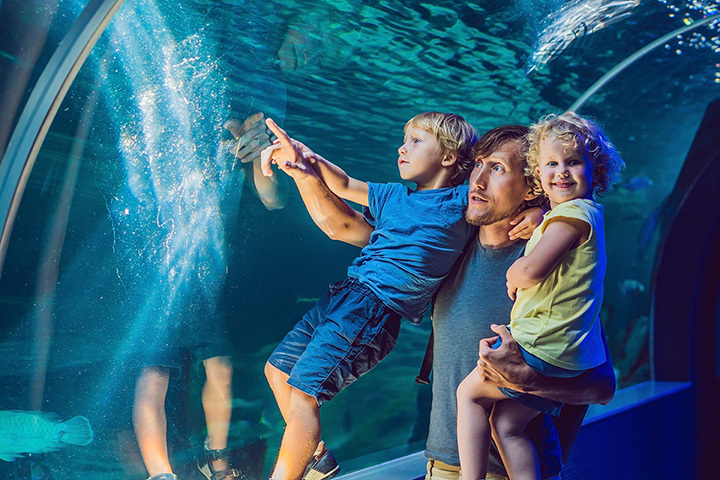 Wildlife favorites at the aquarium are sharks, stingrays, jellyfish and numerous varieties of colorful fish. The Glenwood Caverns Adventure Park has thrilling rides, offers cave tours and has one of the longest alpine coasters in the state. “The Cliffhanger” is a popular attraction because it’s the highest elevation roller coaster in America. Play laser tag, go on the Giant Canyon Swing that launches you over Glenwood Canyon or make your way through the giant maze. Although Glenwood Caverns Adventure Park is open year-round, some attractions are seasonal. Known as America’s only mountain zoo, Cheyenne Mountain Zoo in Colorado Springs is home to 950 different animal species. Endangered and exotic animals call this mountain setting home. See tigers, giraffes, moose, mountain lions and other incredible animals at this zoo. The North Pole Home of Santa’s Workshop is the perfect place to visit during the holidays. This Christmas-themed amusement park features two dozen rides including a Ferris wheel and carousel. Visit the cute village full of shops or be amazed by a magic show. This theme park near Colorado Springs is open from mid-May till Dec. 24th. Learn about dinosaurs at the Rocky Mountain Dinosaur Resource Center. There are actually numerous dinosaur fossils found right here in Colorado. This museum in Woodland Park features 30 full-size skeletons and restorations of incredible dinosaurs. Don’t forget to visit the gift shop. It is the largest dinosaur gift shop in the state. After a visit to the Denver Aquarium or the Children’s Museum in Denver, head straight to the Platte Valley Trolley for a sweet open-car ride boasting views of the Platte river. This scenic tour of downtown Denver is a low-key experience for the whole family. What began as a fish farm in 1977 has turned into a popular reptile park full of alligators, tortoises, turtles, snakes and lizards. These scaly critters stay alive during Colorado’s chilly winters by the geothermal pools on the property that remain at a warm 87 degrees. Located in Mosca in the San Luis Valley, Colorado Gators Reptile Park gives visitors the chance to not only see the reptiles but also pet and hold the small alligators. Tubing is an activity that predominantly happens in the winter where one sleds down a snow-covered hill on an inflatable tube. However, Snow Mountain Ranch has made this activity into a year-round experience. This summer tubing hill is the only one of its kind in Colorado. So, head to Winter Park to enjoy this unique thrill as a family. The WOW! Children’s Museum in Lafayette has hands-on exhibits and will make children feel like they are playing while learning. View the neat and interactive science exhibits or visit WOW! for educational programs. Don’t think that this museum is all about science however, kids will also learn from musicians, artists and storytellers too. The whole family will learn something new at WOW! Children’s Museum.